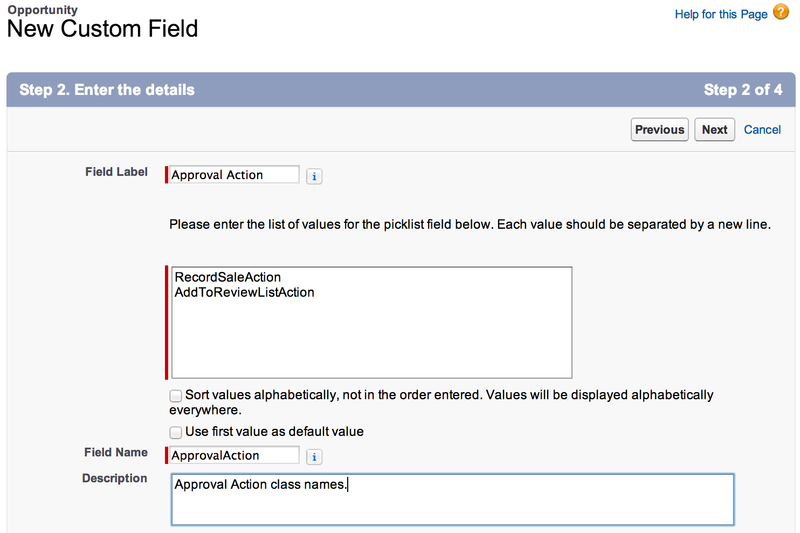 Approval Processes are a great feature of the Salesforce platform. They stand firmly behind the ‘No Software’ banner by giving ‘Power Users’ the ability to configure approval criteria and outcomes via a point and click interface. 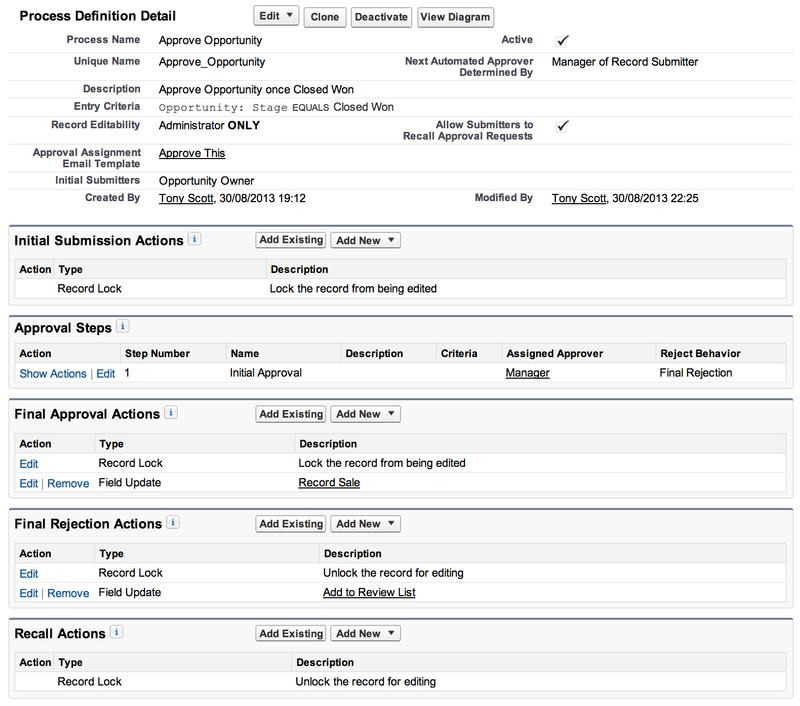 Aproval outcomes can create tasks, update fields, send emails or even send outbound messages to another system. What’s not to like? One drawback, however, is that quite often you’ll find that Approval Processes are created and maintained by ‘Power Users’ rather than developers. ‘Power Users’ often have an intimate knowledge of the business processes but little or no knowledge of the code base. So, when an Approval Process requires a more complex outcome it may be that a developer needs to get involved and the ‘No Software’ premise falls apart. 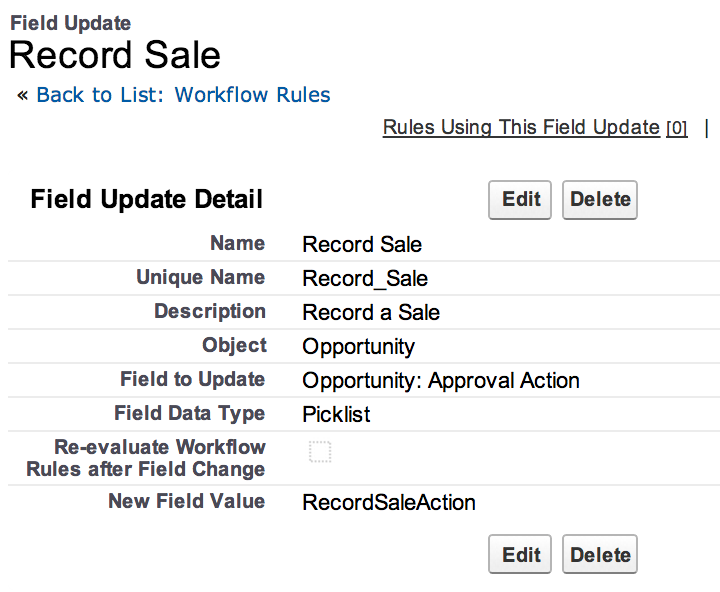 When working on the Salesforce platform in cases like this I prefer to think about how better to empower users. 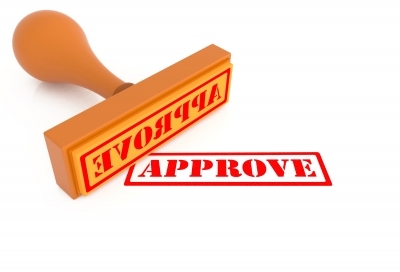 In the case of Approval Processes one way of providing this power is to offer them a suite of approval actions that they can easily plug into their own process flows. To achieve this, I’m going to show you a trigger based pattern that uses a custom picklist field to invoke a custom action. When a user is creating their Approval Process (or even a workflow for that matter!) 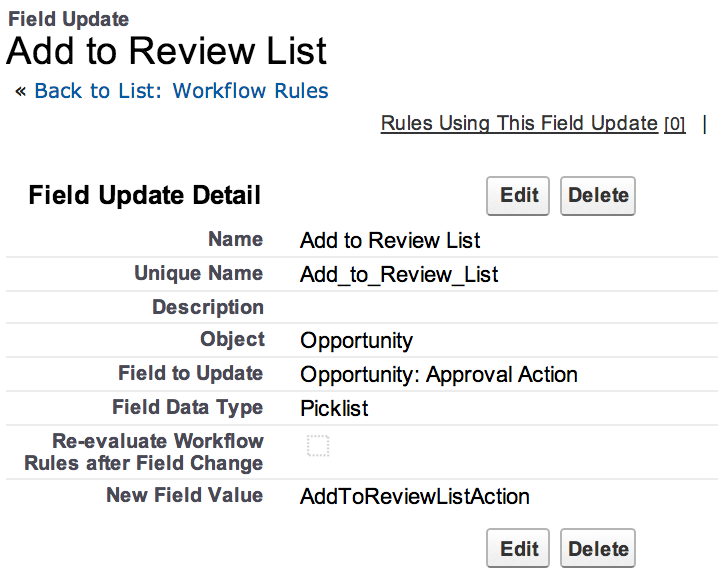 they can use a field update to run a specific action against the object. If you’re working in a managed package this approach is extensible allowing you to package the framework along with a standard suite of Approval Actions and then let your customers implement their own. For this example let’s consider a couple of useful actions we may want to perform when approving or rejecting an Opportunity. If an Opportunity is approved we may want to record a Sale against the Opportunity owners sales target. If an Opportunity is rejected we may want to add the Opportunity to a list of items that require further review at the next weekly sales meeting. The list could go on, you could raise an invoice, produce and email a statement of works etc etc. We’ll begin this approach by defining a global interface that all Approval Action classes must implement. * This method should be bulkified since it deals with an array of SObjects. * Validate the SObject type this action supports. * for the given SObjects. * Arguments:	String - Class locator field to determine the class to call. * Inner class to wrap an actions implementation and payload. You’ll notice that the SObjects are cloned before being added to the Action classes payload. This is because our trigger is operating on the After Update so as not to intefere with any other trigger processing. At this point in the trigger the SObject is read only. Cloning it effectively releases it from its read only state and allows the Action class to fire a second update in order to clear its action state once the action has been completed.